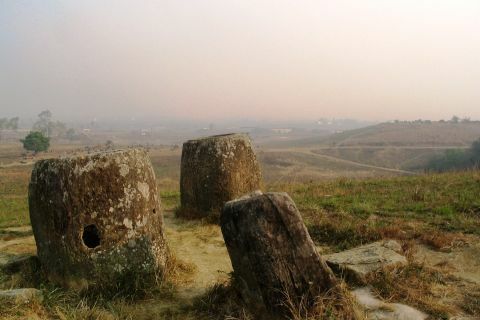 The Plain of Jars is an area around Phonsavan where huge jars of unknown origin can be found. Most of these jars are situated in 3 major sites. 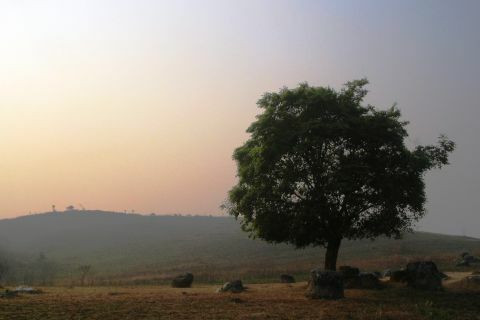 I left my guesthouse for the Plain of Jars at 730am and easily found Site 1. Admission ticket to Site 1 (and other sites) costs just about a buck. 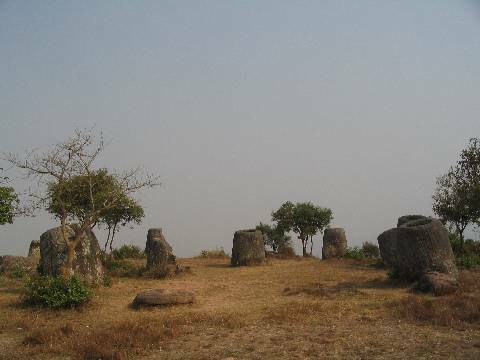 Maybe it’s still early but Site 1 was not crowded with tourists and I find wandering around the sites a very peaceful experience. But make sure you stick to the marked walking trail as they are still UXOs (unexploded bombs) lying around. Site 2 and 3 were slightly harder to locate but manageable with the excellent gt-rider Laos map. When I reached Site 3, I found that my bike was leaking petrol. As usual, I couldn’t figured out what’s wrong with the bike and I turned off the fuel cap to stop the leaking. 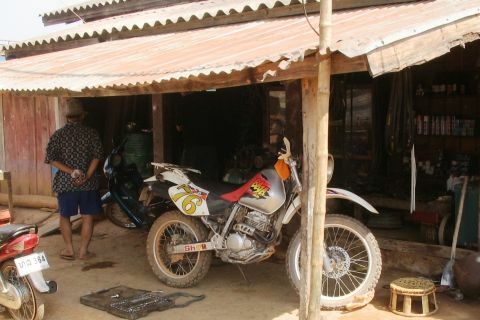 I asked around and found out that there is a mechanic at Lak Hai village, 2km away. I decided to ignore the problem for now and set about exploring Site 3. Site 3’s trail is a very enjoyable hike across paddy dykes and low lying hills. After I completed the circuit, I decided to take down some notes. I dug for my notebook in my jacket’s pocket. There was a hole and the notepad was missing. It’s the notepad where I had logged down my journeys, not just this current Laos trip but also my previous trips. I couldn’t remember where I dropped it. Do I have to go back to Site 2 or Site 1? I backtracked my path at Site 3 and voila! There it is, a turned notebook on the track! Ah, the wonderful feeling of finding something you thought you had lost. As the bike was leaking petrol, I pushed the bike for 2km to Lak Hai village. It was tiring and embarrassing. The mechanic did not seem to be able diagnose the problem. To make things worse, the bike was unable to electric start after his tinkering. I had to call PVO a couple of times for advice. But we had some communication problems and I passed the phone over to the mechanic. I was left wondering what they were discussing and what the mechanic was doing. 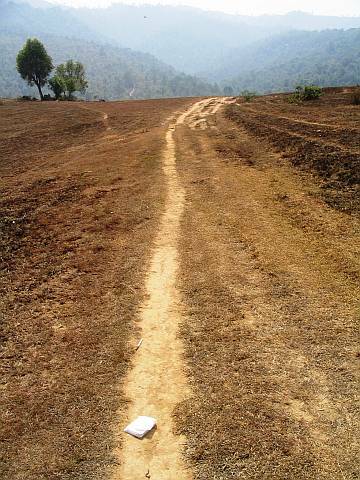 After 1.5hr of little progress, I was thinking about towing the bike back to Phonsavan. Finally at 2pm, as if by miracle, the bike roared into life and the leak was gone. I paid the mechanic 400k Kips. I reached guesthouse at 245pm and paid 1.5 day of room. I quickly set off for Vang Vieng at 315pm. It was yet another day without lunch. For the first 50km, it was straight road and I managed to hit 80km/h. 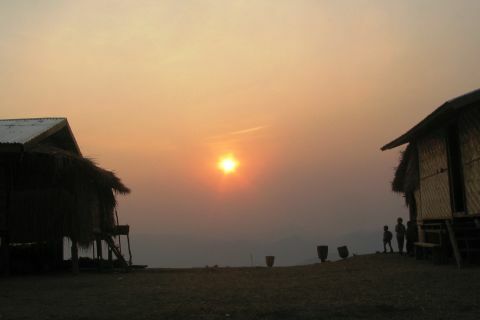 I was optimistic about reaching Vang Vieng before nightfall. But the road soon turned winding. When I reached Kasi town, it was totally dark. I rode in almost total darkness during next 50km to Vang Vieng. Pampered with excellent lighting conditions in my homeland, it’s tough negotiating the roads with just my headlights. I had to go really slow and huge trucks carrying logs overtook me frequently. There was also the constant kamikaze insects splattering themselves on my helmet and clothing to deal with. A huge surprise met me when I reached Vang Vieng. There were so many tourists, food stalls, guesthouses, souvenir shops and restaurants. Westerners were lying on mattresses, drinking beers and watching videos. It did not look like a place I would want to stay for long. I went searching for a room and only managed to find one at the third guesthouse I visited. For dinner, I went to Nazim restaurant. The Indian mee goreng, egg prata and iced coffee were very good. 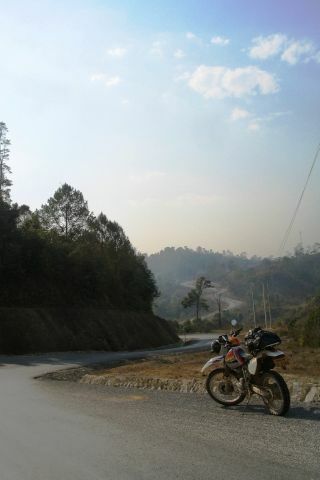 This entry was posted in Laos, Motorcycle Adventure Vacations and tagged Laos, Phonsavan, Plain of Jars by atticus. Bookmark the permalink. 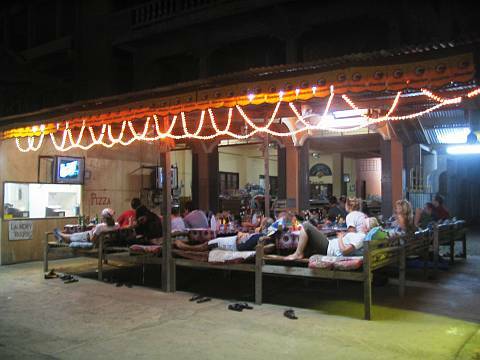 sit all day watching tv….fun way to see Lao.